New Jersey Senator Cory Booker is running for president in 2020. The Rhodes scholar and former mayor of Newark is known for making a splash in politics and entertainment — the documentary Street Fight, his outspoken criticism of President Trump, his “Spartacus moment” during the Brett Kavanaugh hearings, his guest appearance on Parks and Recreation — but not as much for his athleticism. Booker, a 6-foot-4 high school football star, was recruited to play for Stanford University as a tight end and wide receiver. As a junior, he played a key role in the team’s upset 1990 win over No. 1–ranked Notre Dame. But after two years, his football career ended in disappointment. Paul Nickel, tight end: He was hot coming in. I have to say this delicately: He was highly touted, and he probably didn’t pan out the way they wanted him to. [The expectation was that] he was headed to the pros. But he was never big-headed. Very down-to-earth. Glyn Milburn, running back: I believe [Booker] was an All-American high school player, so he was very highly recruited coming out of New Jersey, and naturally there’s a level of expectation that comes with that. Some circles would think blocking is beneath him. But he wasn’t that way. He was someone who did whatever the job was assigned to do, and I think that speaks to his character as well. Tommy Vardell, fullback: We came in in the same freshman class, and Jason Palumbis and Cory Booker were the two most notable recruits in our class. I couldn’t imagine a defensive back — which was part of his profile, that he had played safety — and being in a 6-foot-4, 225-pound frame, it was pretty exciting to have him on the squad as a freshman. J.J. Lasley, fullback: Unfortunately, we had coaching changes, which definitely affected his playing time on the field. He was a good college player who, in the right situation, may have gotten a shot at the NFL. Photo via Paul Nickel. “88 is me. 81 is Cory Booker, my two-a-days roommate. 10 is Ron Redell, my roommate during school, who is a bigtime Republican,” he writes. Milburn: My first year at Stanford, I was red-shirted, which means I mainly just practiced and didn’t play in any games. So I got a lot of observations of other people, and I just always remember Cory as someone who was very articulate even in social settings. He was very well spoken. Nickel: I’m from Ohio, and there’s a reason why I’m bringing that up before talking about Cory. 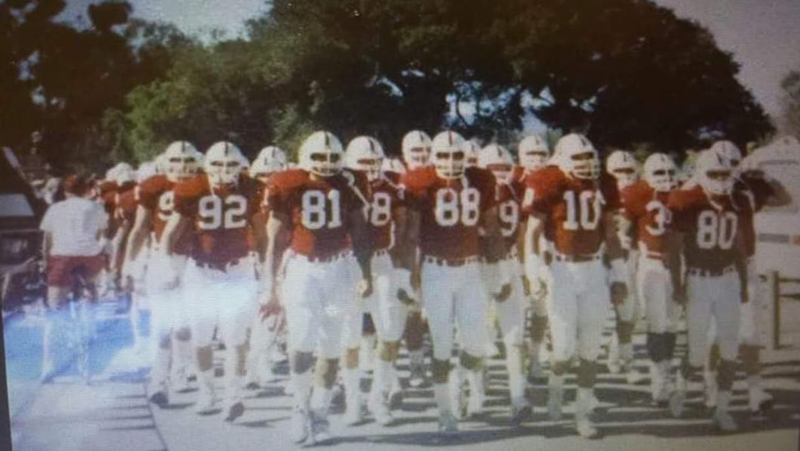 [Stanford] was a predominantly white school. I hadn’t been exposed to many African Americans. [I was] kind of a naive kid from the Midwest. He’s from New Jersey, and he approached me and he was highly intelligent, very smart guy, just nice to be around. Very helpful. Showing me around campus when I first got there. Milburn: I assumed he was going to have this thick New Jersey accent [and] be the caricature of New Jersey if there is one… but he wasn’t, he was was very dedicated to the team, and I think that’s probably the best I can say it. He was someone who didn’t stand up for the wrong reasons. He wasn’t the guy leading the charge to the dining hall. Vardell: I remember he “quartered” me inside my room — he got a stack of quarters and put it in the door jamb, and then I couldn’t get out. Eventually we finally figured it out. The thing is, we didn’t try too hard, because we had an optional/mandatory computer class just to prep us for school, so the quarter jam actually gave us an excuse to go back to go back to bed and sleep in. Nickel: Well, I mean I’ll just tell you, the first time I met him, my family is dropping me off. He could tell I was a freshman. I was kind of a deer in headlights, and guys were working out already, and I wasn’t prepared at all. And Cory says, “No, no, I’ll get you some shoes.” I think I borrowed his shoes just for that one session. Which he didn’t have to do, you know, he didn’t have to do that. In fact we were in the same competing positions, so it would’ve been very easy for him to ignore me. Vardell: Especially when you’re a freshman and it’s your first time away from home, training camp is a pretty special and vulnerable time. I think there’s a very natural bond between and among us that comes from just shared experience of pain, suffering, excitement, joys together, there’s something very meaningful about it that stays with you. Lasley: He was then who he is now — a great person with a huge smile and full of positive energy. Milburn: He wasn’t the guy who was going to say, ‘No, I’m not going to do this assignment because somebody else, a freshman, can do that.’ He just did what the play was called to do. Nickel: I ended up being his football roommate during two-a-days — which is like an eight-week journey, because our school doesn’t start until like October 1st or September 30th. And the football team gets there like July 29th. So I was stuck with him and he was stuck with me. [During two-a-days] after practice, you’re very much in your room or taking a nap, so you get to know someone pretty well. But it worked out. He was a good storyteller, he always had jokes. I wasn’t sitting in his lap when he was telling the story, but we just happened to have bunk beds for those eight weeks. I also remember noticing how neat he was. For a 19-, 20-, 21-year-old guy, men tend to be (if I’m stereotyping) sloppy with our lockers and all that stuff. He was not that way. That’s one of the first things I noticed about him: This guy is different. He’s a different cat. As a person, they don’t make many men like him anymore. I think he’s a very genuine guy. We probably have some different political views, but he’s very strong-willed, strong-minded. Lasley: Cory was a great teammate — he was an articulate player who helped others in his explanations of the offensive schemes, especially the younger guys. He worked hard and never seemed to be at odds with anyone on the team, nor the coaches. Vardell: Cory was always a happy presence, and never too intense, always friendly and he was even that way during that time. I think he has a purity in his nature, he’s a genuinely nice and good person. I don’t think that I ever ran into Cory in the hallways, in the locker room, anywhere that he didn’t have a smile and some exchange of words that weren’t positive. Lasley: He was definitely a positive role model for the young guys and always held his head up with class and respect. I remember talking to him about the Bill Walsh offense that Denny Green was installing and he helped me understand the overall picture between the run and pass game. [He] helped me see the field more due to said understanding. Nickel: Yeah he was a good teammate, man. I mean, there’s no other way to describe it. He was sincere in helping you when he could have easily ignored [you], you know? Paul, I wouldn’t do that on this particular play. I would maybe try this approach. Milburn: I don’t have a particular story where Cory like stands up in the locker room and gives a resounding speech about the importance of winning a game. I just think in general, if I look at teammates, Cory was the consummate team player. Nickel: I just think that’s a really good teammate, because we’re all very, very competitive people. When you play Division One football, or any sport for that matter, it’d be very easy to think, I’m competing with that guy. I’m not telling him squat. He never really did that. Milburn: I wouldn’t classify him as someone who was feared, and I don’t say that in a negative way. Cory was someone people genuinely liked, but he didn’t have a mean streak where you’re afraid to go against him in practice. Nickel: I think he was big and physical when he wanted to be. There were some times, I think he wasn’t as physical, but he was extremely athletic. Great pass receiver. Milburn: I can’t give a personal experience given my position and his position, but I don’t think that, if you polled other teammates, they would [call him] a dirty player. He was a big player. He’s someone who, physically, is imposing at the collegiate level. Vardell: It’s kind of hard to characterize how he was as a player, I wouldn’t say that he was super-intense. He was a great presence, detail-oriented, a student of the game, he made good decisions on the field — he did everything that you would want him to do, there was never any fallout from what he did on the field. Contrary to some of the stances he’s had to take and the persona that you see right now, he was actually very, kind of agreeable and adaptable on the football field. He definitely wasn’t one that was making big statements and causing any turmoil. Lasley: I never thought about anyone’s future outside of football, but looking back now, it doesn’t surprise me. He was charming and had great rapport with everyone, from teammates to coaches to trainers and front office — he just made you feel like he was truly listening when in conversation, which makes sense now. Milburn: So, you know, at Stanford at the time we didn’t have many players that were his frame as a tight end, and so he was able to demonstrate a lot of his arsenal — his ability to not only catch a short pass but also to do something with it afterward. Because he had a large frame, he was able to block, but he was also able to run faster than probably most people thought [he could] at his size. So he was someone that our team wasn’t afraid to put out there and know that he had a physical advantage against the smaller linebacker or someone who could block on the edge. [We] know that he could hold his own. Milburn: His most famous game, and one of our most famous games as a team, was against Notre Dame. He had a pretty good game, and if you’re going to have your career game, you better have it in on the biggest stage. Wardell: At the time we were 1–3 and the Irish were No. 1 in the nation, so it was a big deal. They didn’t go into the game with the game plan to cover the tight end, and Ed McCaffrey and Glyn Milburn — they might not’ve been open, but Cory was dragging across the field and making key plays. Milburn: Notre Dame had Lou Holtz, with Jerome Bettis, Ricky Watters, and Rick Meyer, who were all eventual high-first-round draft picks or close to it. And our Stanford team, which had just come off a losing season, had a losing record heading into the game. I don’t think anyone picked us to win, but we just kinda hung around. We played tough. Nickel: I remember Cory even juked Todd Lyght, who was an All-American and went on to play with the Rams. Someone did not make that video up. I was there, I saw him do it. Lasley: Cory had good hands as a tight end, and he wasn’t afraid to go over the middle. He was at his best blocking bigger defensive lineman during the run game. Milburn: We ended up having a pretty competitive game and Cory made some key catches and also had some yards after the catch, which I thought were really impressive given, you know, he was a large tight-end, a big body a blocker, but was athletic enough to run routes and catch the ball and create some highlight-reel stuff. Vardell: It was just a great experience and a big part of Stanford history to which he was a big contributor. He had an opportunity, he stepped into it, he executed and it was a part of a great afternoon. Lasley: He was not a flashy guy off the field. He carried himself with class and respect and was never in or around any trouble. Nickel: He wasn’t a drinker, so you didn’t see him at a lot of parties. Not that you have to drink to be at a party, but he was a little different, right? He was a Rhodes scholar who didn’t drink. So we didn’t see him as much on the social scene, but he always had a smile on his face and he was always pleasant to be around when you did see him. Vardell: Cory, Jason Palumbis and I were, I think, the only people on the team who didn’t drink. So he always stood out to me as one of those people — that he was standing for something that he believed in, not in a way that would brand him as being anything other than standing by what he wanted to do and not getting swept away by the drift of everyone else around him. It can be a lonely road to walk, especially when you’re on a football team. Lasley: I thought he was an interesting person off the field, and we used to get into deep discussions about all sorts of things outside of football. Again, looking back, it makes sense he’s a politician now and running for president. Nickel: If I walked on campus, people knew I was more than just a football player, but when he walked on campus, you definitely knew he was more than just a football player. That guy was involved, in all kinds of stuff. Vardell: Student athletes, they obviously have people that they gravitate toward, but it’s not cliquey, there’s not really time invested in deep-down hangouts. It’s a much-different college experience than most people probably have. So would we sit down and have dinner together at training table, were we spending time on Saturday night together? Not necessarily. Everyone is just kind of on their own track. Vardell: It actually wasn’t too different in the pros — you kind of end up having a bunch of independent people living parallel lives, and kind of interacting along the way. But nobody depends on anybody else, and you have connections, but they’re just kind of along the way to a greater purpose. Milburn: I know he ran for student body president and won, which would be rare for an athlete at the time, and speaks to his popularity and his ability to transcend just being an athlete. But for someone who had the courage to run for student government as an athlete and the demands on that, I thought, was pretty impressive. Vardell: [As a student athlete,] your lives are pretty well-programmed. I don’t think people realize the level of dedication and the time commitment involved with playing a sport in college — and being a student on top of it. Especially if you’re like Cory and looping in all the extracurricular stuff and volunteer work and everything. He didn’t have a whole lot of time to just hang out. Nickel: He was also involved with some hotline, a suicide hotline at Stanford. It was called the Bridge, and it was put in place because of the pressures at Stanford. He would be called on at any point in the night to talk to you and he would leave and go across campus and talk to people if they needed to be talked to. Vardell: He did work [at the Bridge] long before it would’ve been characterized as a motive to further oneself or posturing or window dressing or anything like that. He was genuinely just Cory being Cory, you know, helping people. Nickel: I never had to call the Bridge, so I don’t know how it works, but I do know he was a part of that because many people have told me, ‘Well he’s talked to so-and-so,’ and I’d say, ‘Well, how do you know that?’ And they’d say, ‘Well, he was here at 2 in the morning!’ He was well known on campus. People knew who he was. Milburn: So this was someone who was accumulating a pretty impressive resume of accomplishments. And it’s interesting to see that even then he had the ability to unite. Milburn: By a certain point, he was a Rhodes scholar, student body president, member of the football team… I thought, Wow, this person’s going places. And not too long after that, he becomes a mayor, then a senator, and goes on from there. Nickel: I recall thinking he’d definitely become a CEO of a company some day. That was one of the things I said. I didn’t know that he’d be going for the CEO of the United States, but pretty close. Milburn: At the time, I didn’t think I was in the locker room with a presidential candidate. I don’t think many people can forecast 30 years ahead, but clearly someone who was able to be a leader among his peers and do some things that very few people were able to accomplish, [that] says a lot about him. Nickel: He has this certain drive about him that’s hard to describe, but he’s very approachable. I mean, I haven’t seen him in probably 20 years, but I’m just saying that if I saw him down the street, I know he would stop his caravan to walk across and say hello to me. I would be pretty surprised if he didn’t, in fact. I’ve watched him, even [in] his kinda over-the-board “Spartacus moment,” I could see him, you know? He is what he is. Vardell: That’s how I remember him, as an independent thinker who always had a smile on his face and always gave exchanges that were pleasant and uplifting, and I think that’s a pretty good legacy to have.